Does anyone else often find that their closet is a hot mess, despite their best efforts? Do you struggle to find things in your closet, even though you know they are there? I have definitely been there, but at the moment, I’m in a much better place with my closet. Today, I’d like to share some tips for keeping your closet clean and organized. It sounds a little crazy, but did you know that by using hangers that are the same width and thickness, you can actually save yourself some space on the closet rod? In addition, it also gives your closet a more streamlined, more uniform appearance. Labeling boxes and bins not only helps you to find things more quickly, it also ensures that everything has a proper place, and that you put everything into its proper place each day. Pants will always hang more neatly than shirts. For this reason, hanging pants on eye level will make your closet appear overall more neat and clean. A cleaner closet also feels more organized. 4. Twice a year, purge what you don’t wear anymore. I like to turn my clothes hangers a certain direction, and after I wear the garment that season, I turn the hanger the opposite direction. At the end of the season, I turn the hanger the opposite direction. At the end of the season, anything that worn that no longer fits is donated, sold or given away. 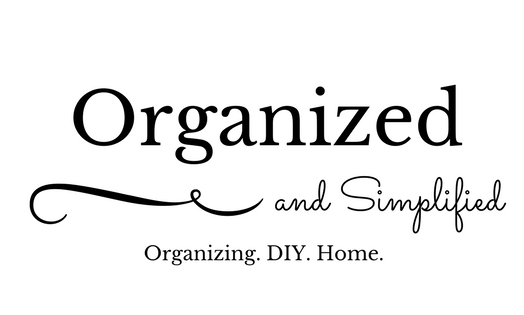 I hope you have enjoyed these tips for organizing your closet! Stay tuned tomorrow for a summary of week two. Ugh. I couldn’t find a thing and every time you opened the door, things would fall out. It was a big mess. My dad, before he passed away, was a good carpenter. He never worked as a carpenter; he just happened to be pretty good at building things. I downloaded this Ana White plan, and he felt confident we could build it. I don’t know if you have ever used an Ana White plan before, but they are amazing. She includes a shopping list with everything you’ll need and even a cut list to tell you how to cut your boards. They’re really easy to follow. My dad built that closet organizer shelf in about two hours. We added a double rod on only one side so that when the girls are older, they have one side to hang dresses. I then took some old diaper boxes and covered them with fabric. I already had the baskets on the top shelf. I then added labels to the boxes as well. I made them on our computer and then laminated them. I also created labels for the bins in our youngest daughter’s closet. Remember the closet that looked like this? And best of all, we created both of these closets for less than $100. Before you buy an expensive closet organizer, head on over to Anawhite.com and create your own…for a lot less.